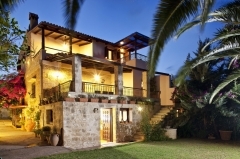 If you decide to rent a private villa in Crete, you are making the right choice! This island combines reality with mythology and tradition with modernity. Crete is the largest and most populous of the Greek islands and the fifth largest island in the Mediterranean Sea. It offers its visitors enormous pleasure in its soft climate and introduces them to numerous wonderful beaches surrounded by natural beauty. The luxurious villas that we offer you are ideal for people that are looking to enjoy their vacations in a hospitable and peaceful environment whilst taking opportunities to take pleasure in local culture, natural beauty, climate, the warm summer sun and the cool sea. The island indeed has a rich history and many traditions. History and culture-lovers will be in their element here as there are numerous archaeological sites where you can experience the Antiquity.